Fiber: Hello Yarn Fiber Club merino, in "Patchwork"
Spun/plied: 17:1/15:1, short forward draw, aiming for speed. Stats: 179 yds/4 oz, approximately worsted weight. Comments: I split the top in half, then stripped each half into four long pieces and spun each half on to one bobbin. I was trying to spin this quickly, so I used a high ratio to get the twist into the fiber fast. 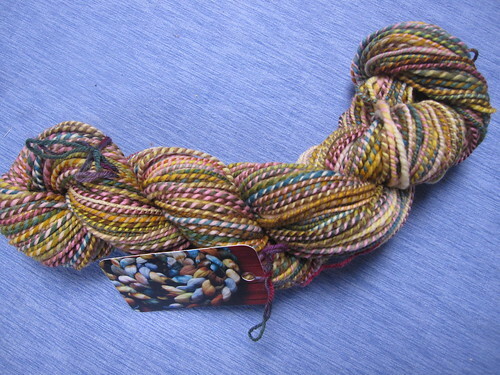 I also tried to spin a slightly thicker single then my default, so the final yarn would be a heavier weight. I'm pretty pleased with how it came out though, and I think this skein is destined for Boo legwarmers. From start to finish, the spinning took 3:36, so I rounded it up to 4 hrs with finishing. So that gives a starting price of £40 for spinning, plus £15 for the fiber itself, which ends up at £0.31 per yard. 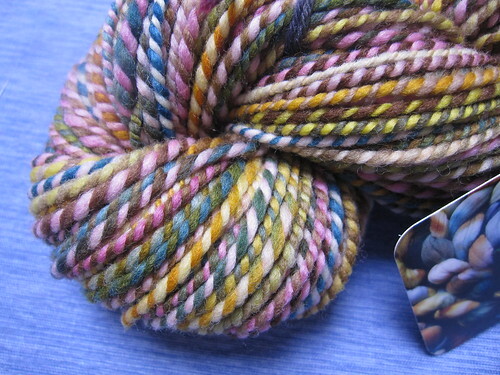 £55 seems like an awful lot for one skein of yarn though, so I might split this in half. It's still within the range I've found online though, so we'll see. This certainly isn't going to make me rich however! I also need to try some woolen spinning and see if that makes a dramatic difference in the amount of time this takes, or the yardage. That, however, will have to wait until September. Written by porpoise On August 26, 2011 In "fiber club", "spinning"